A Guyanese aviation company, Domestic Airlines, on Wednesday secured an injunction in the Eastern Caribbean High Court preventing the removal from Anguilla of a Cessna 206 plane, which was flown out of Guyana without aauthorisation. That plane and another one have been flown out of Guyana despite a Guyana High Court injunction. The ex-parte application for an interim injunction was granted by Justice Cheryl Mathurin in chambers of the Anguilla Circuit against Munidat Persaud, Oxford Aviation and Daniel Frederick. “The respondents are restrained whether personally, jointly, severally or by their agents, servants or assigns from interfering with, attempting or actually removing, relocating, flying, boarding, carrying out any mechanical work, refueling, dismantling, selling or transferring, carrying out any inspection of an aircraft currently located at the Clayton Lloyd Airport, Anguilla being a Cessna aircraft with registration mark 8R-GMP serial number U206-1117,” the court document states. The injunction is valid until July 21, 2016 by which time lawyers for Oxford Aviation, Persaud and Frederick are expected to file responses to facilitate a hearing and determination on whether the injunction should be made absolute. Representing Domestic Airways and Orlando Charles are Samantha Wright of Wright and Company Solicitors in Anguilla. The interim injunction was granted after the court was presented with affidavits by Charles and Attorneys-at-Law Stephen Roberts and Nigel Mercurius. The plane bearing registration number 8R-GMP was barred from leaving Anguilla on June 26, 2016 because the Civil Aviation Authority there said it did not have an airworthiness certificate to continue on its journey to San Juan, Puerto Rico. 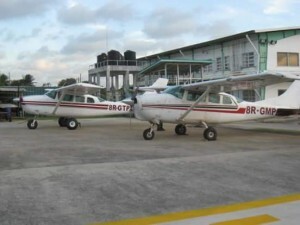 However, the Cessna 206 with registration number 8R-GTP was allowed to leave, despite requests and the forwarding of documents by the Guyana Civil Aviation Authority to its Anguillan counterpart. Persaud and an unnamed person flew out the planes from the Eugene F. Correia (Ogle) International Airport during the pre-dawn hours of June 26, 2016 without immigration, air traffic control and customs clearances. Frederick has since insisted that he never flew any of the planes out of Guyana. Persaud removed the planes in violation of a High Court injunction pending the hearing and determination of a case in which one of Oxford Aviation planes had allegedly damaged a plane belonging to Orlando Charles’ Domestic Airways. Oxford refused to pay the claimed amount for the damage and was taken to court. Sources said the planes flew through Trinidad airspace, landed in Grenada and then Anguilla where they were detained until one of them was given clearance to depart for Puerto Rico on Sunday, June 27, 2016.